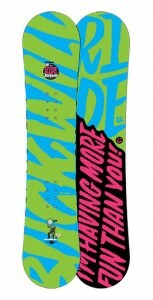 Snowboards make awesome Christmas gifts. A snowboard encourages a kid to get outside, exercise, and practice something that they have a passion for. It’s also a great gift because, in many places, they can go outside and use it almost immediately without waiting for the seasons to change. Not only is the Burton Chopper one of the most flexible and forgiving boards out there, they also come in some of the smallest sizes around. This means if your kid can walk, they can probably find a Burton Chopper that’ll fit them. Not that these boards should be limited to those who are just barely able to walk, as they’re full-fledged boards in their own right. In fact, the Chopper is more or less the same as Burton’s LTR (Learn To Ride) boards that you’ll find in rental shops all over the world. It’s easy to assume that thousands upon thousands of people have learned to snowboard on Choppers or their larger siblings (LTRs), so it’s a perfect first step for your grom. In the interest of getting groms started, Burton also offers their ‘After School Special’ package that includes bindings. 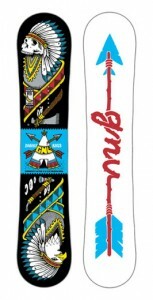 You can also get the boards with Star Wars themed graphics (or if you’re willing to do a bit of hunting, you can find Toy Story graphics from previous years if that’s more your grom’s speed). The Burton Chopper comes in 80cm, 90cm, 100cm, 110cm, 115cm, 120cm, 125cm, and 130cm. 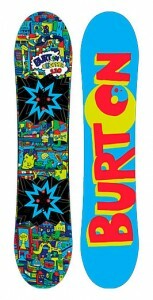 Check out Burton’s website for more info. As your grom gets the hang of snowboarding and starts looking to steeper runs and maybe dipping their toes into the terrain park, they’ll also be ready for a board with a little bit more stiffness and a little bit more speed. 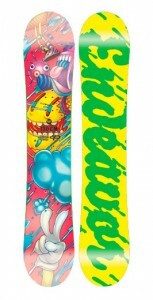 The Shorty from Vancouver-based Endevor snowboards should fit the bill for this progressing ripper. It features a 360° beveled base to keep edges from catching on snow, boxes and/or rails, and a completely flat base (no camber, but no rocker as well) which creates a forgiving board that will give groms a little bit more speed. There’s also a full length poplar core, biax fiberglass and full twin shape, but what your grom will notice first are the sweet graphics. The Endevor Shorty comes in 100cm, 110cm, 120cm and 130cm. Learn more about it at Endevor’s website. By the time your grom is ready to take things to the next level, they’ll probably already know who Danny Kass is, which should make this board an easy favourite for them. The Kass-Mini from Gnu also got a lot going on for it beyond it’s signature pro. Gnu’s “BTX Rocker” shape focuses the rocker between the feet and flattens it out at the tip and tail, helping your grom carve turns and float in powder. Unique to Mervin Manufacturing (makers of Gnu and Lib Tech boards) is Magne-Traction technology which is, in effect, a serrated edge instead of a smooth sidecut. This helps dig the edges into even the hardest snow and ice, increasing traction. This feature is VERY useful for lighter riders who don’t have the weight when riding boards with standard edges to dig in and grip on icy days. The Gnu Kass-Mini comes in 100cm, 110cm, 120cm, 130cm, and 140cm. Learn more about it at Gnu’s website. There’s a wide range of snowboard groms out there, from the kids just starting out to those who feel more at home strapped to a board and charging down the pipe than wasting a powder day playing video games. The Lil’Buck from Ride is for the latter. Aside for some minor modifications to the width and stiffness, the Lil’Buck is a shorter version of Ride’s highly regarded Buck Wild board. It features their “Twin Rocker” design which aims to offer the best of both rocker and camber, along with their “Slimewalls” sidewalls that offer a bit of relief to the sidewalls upon impacts instead of transferring force direct to the board and possibly breaking. This is a fantastic benefit to anyone who’s ‘sponsoring’ their young rider before they sign their first pro-deal. Make no mistake, this is not a board to learn on, and not really a board to progress with, but if your grom is constantly leaving you in their dust and always looking for the next hit, drop or rail, this could be the perfect board for them. The Lil’ Buck comes in 135cm, 139cm, 142cm, 145cm, and 148cm . Check out Ride’s website to learn more about it.